One of the biggest parts of a wedding is the flowers that are included. There are flowers for the bouquets, flowers for the church, and flowers for the mothers, grandmothers, groom, and ushers, as well as centerpieces for the reception. Something that should be taken into consideration when selecting the flowers to use in a wedding is that sometimes there are people who have allergies and may be affected by the scent of the flowers. When you are choosing the type of flowers for your wedding, think about yourself and your attendants especially. Are there any sensitive noses? The last thing that you will need on your wedding day Is to have yourself or one of your attendants having a sneezing fit in the middle of the ceremony. 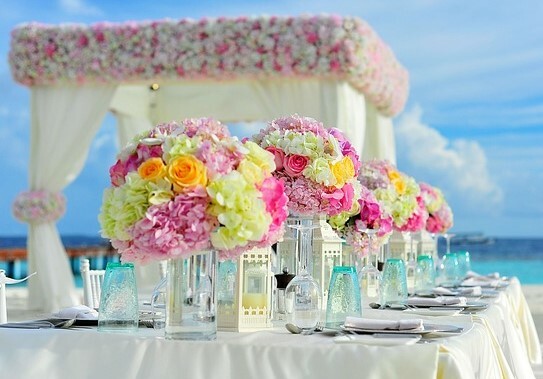 Once you have chosen what type of flower you want to have for your wedding, the next thing is to decide on the colors. Usually the colors for bridesmaids and groomsmen will correspond to the colors of the bridesmaids’ dresses for the bouquets. But when it comes to the grandmothers and mothers flowers it may be a good idea to find out what color their dresses will be so their flowers will match. So that there aren’t a lot of flowers left over from the reception, it’s not a bad idea to mark a chair and whoever sits in that chair gets to take home the centerpiece. This way the flowers can be enjoyed for longer than a day and you don’t have to worry about what to do with them.